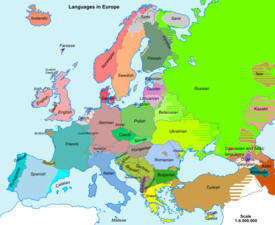 Europe is a continent, the western part of Eurasia. 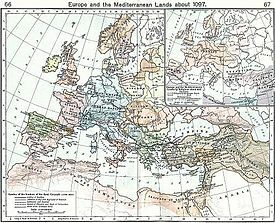 It is not part of Asia, because of a traditional eastern boundary that includes the Ural Mountains in Russia and the Bosporus in Turkey, and from Africa by the Mediterranean Sea to Balkans. The Atlantic Ocean is to the west of Europe. There are over 50 countries in Europe. Andreas M. Kaplan describes Europe as "embracing maximum cultural diversity at minimal geographical distances". The European Union is made up of most of the countries in Europe. The city with the most people in Europe is Istanbul. Europe is named after a person in Greek mythology called Europa. She was said to have been abducted to Crete by Zeus. The name was later used for Greece. Then as the rest of the area we call Europe started to have cities and empires, the whole area West of the Ural Mountains became known by the same name. 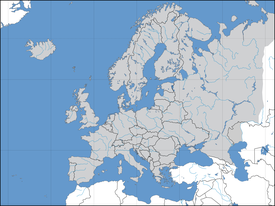 In Europe there are different climates in different places; for example, in the north like Finland it stays snowy in the winter for 5–6 months and is about -30 degrees Celsius. However, during winter in Spain it is warmer and hardly snows, except on high mountains. At this time, much of the continent shares some rulership in a body that is above any country, called the European Union. Kosovo Note: Not officially recognized. Cyprus (EU) Note: Completely in Asia. Russia Note: Geographically in Europe and North Asia. Turkey (Official Candidate of EU.) Note: Geographically in Europe and Western Asia. ↑ "Andreas M. Kaplan: European Management and European Business Schools: Insights from the History of Business Schools, European Management Journal, 2014". http://dx.doi.org/10.1016/j.emj.2014.03.006. This page was last changed on 11 May 2014, at 15:23.